Serenity Now: Raise Your Hand if You Can't Go to Blissdom! While I am excited for all of my bloggy friends who have the privilege of attending the Blissdom conference this weekend, I couldn't help but be a little sad about the fun and opportunities to learn that I'll be missing. And the Harry Connick Jr., of course. It's easy to steer yourself right into a case of insecurity when faced with disappointments like this. My blog's not popular enough. I don't receive as many comments as they do. I wouldn't know anyone anyway. Snap out of it, Amanda! One of the things I think I'd enjoy most is the chance to meet some of the writers whose blog posts I've come to enjoy reading daily. So I thought, why not offer a little networking party right here at Serenity Now? A chance for all of us to show off our stuff, offer encouragement, and focus on the good things! On Wednesday night, after 10 pm, I'll post with Mr. MckLinky and you can have a chance to stop by and link up a post that lets everyone know why YOU have a great blog too! Do you have a unique niche? Do you make an effort to post regularly? Do you love to visit the blogs of people who comment on your site? Be creative and think beyond "I have a nice sidebar background." It will be fun to spend a few minutes at the end of the week *meeting* a few new bloggers while our other lucky friends are off swooning over handsome Harry. When they return to blogging next week, we'll all have something fun to talk about and some new bloggy friends. If you won't be in Nashville this weekend, I hope to see you linking up here at Serenity Now! I want to know why your blog rocks. PS. 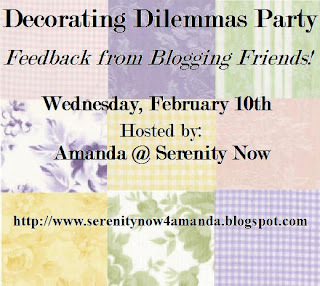 Don't forget that the next Decorating Dilemmas Party is coming up soon! Mark your calendars! I live in Nashville and won't be going. lol. I enjoyed your post. I'm new to blogging and don't have near the followers you have!! tee hee. Thank you for stopping by junkblossoms. Hope you'll come by often. We enjoy company. Pat. Oh, yes, my lip is sticking out a little bit, too....I mean, HC, jr...for goodness sake. How cool is that? So I'm thinking what can I do to add to the fun......it's gonnna take some thinking. I've been recouping from my retreat, so maybe by the end of the week, I'll be good to go again. What a GREAT idea, my friend. Raising my hand here as another blogger who is not going! I guess I'll never go since it is during the school year! Your party idea sounds fun. Thanks! I've been blogging over a year now, and I LOVE it. It's not so much for the readers as for myself. A little free therapy, if you will. =) No conferences for this girl! Aw, I was soooo stinkin' jealous when I heard harry would be there. I've had a major crush on him since I was 14. Great idea for linky party! Fun idea for a linky! I love your blog! You keep me sane with my own insanity at home with my kids. Keep up the great posts! You rock! Great idea! PLUS we should all start putting back a buck here and there so we can all meet up at Blissdom next year!!! i am so excited for the party and will definatley be linking up!!! You are so smart! What a great idea! I LOVE Harry Connick, Jr. He is so pretty. But, this will be fun too. I'd love to meet some new bloggy friends! Oh, gosh, Amanda. What a cool idea! I'm not sure that i could honestly say "my blog rocks," but I do try to make it a fun place to visit. Hmmmm. Anyway, I think a lot of us have been feeling kind of sad that we can't go to BlissDom, so it'll be nice to get together this way. 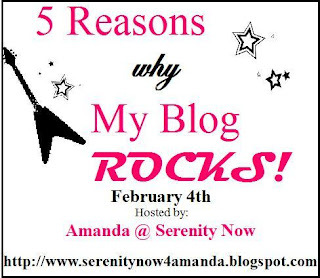 I can honestly say that your blog rocks! How's that? Oh, girl! Your blog definitely doesn't have to be big to go!! Really, all you have to be able to do is pay the money for the conference/lodging/travel. The only way I'm able to go is that my mom gave me a free airline ticket. I'm just a dorky poser going to hang with the cool kids. LOL I'll fill you in on all I learn! What a great idea! I'm sure there are TONS of amazing bloggers and blogs out there that should go...or would go, given an opportunity...but sometimes for so many reasons, it just doesn't work out. Take for example, the crippling weather we've had in my corner of the world....or other reasons, like LIFE! I'll see ya at the party! Loving this. I've been bumming about Blissdom, too. This is a great idea! Im totally coming back on Thursday! I love this idea Amanda and I had no idea what Blissdom was until I read about it on a few blogs this week. It is funny how blogging can make you feel VERY insecure but it's also such fun to have new visitors AND find great new blogs. Blogging is such a two-way street.